Have you ever had that sinking feeling you get when you return to your Springs Apartments home after a long day only to realize that your keys are sitting inside? We've all been there. Calling a locksmith is expensive, and a break-in attempt could get you a visit from local law enforcement. What's the answer? As with many emergencies, preparation is the key to avoiding being locked out of your home. Use these great tips so you're ready if you ever find yourself on the wrong side on your front door. Don't wait until you learn the hard way! You no doubt already have the numbers of your family members or roommates. Be sure to include other helpful numbers such as our Springs Apartments rental office and maintenance team, police department, and a local locksmith. Yes, you could Google them on your smartphone, but it will be so much easier if you have them at your fingertips. Leave a spare key with a friend or family member who fits these two qualifications: (A) they are completely trustworthy; and (B) they live nearby. Giving a key to someone who lives an hour or two away is an inconvenience for both of you. It sounds so simple in theory. In reality, attempting a break-in can cause more problems than it solves. Alarmed neighbors may place a call to the police, or you could end up with damages that you would be responsible for. It may even qualify as a lease violation for which eviction proceedings could be initiated. Under the welcome mat is a played-out cliche and not very safe. 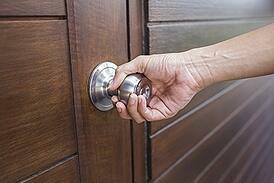 Lock boxes that hang on the doorknob, such as those used by real estate agents, are a relatively inexpensive solution. You might also consider a small magnetic key holder that you can put on your car. Call the locksmith only if you are completely out of options. They will arrive on their schedule, not yours, and the bill won't be cheap. Even though they're professionals, there is still the possibility of damage. At Springs Apartments, we understand that emergencies happen on their own timetable. That's why our maintenance teams are on call 24 hours a day to solve those problems that come out of the blue. Team members know how valuable your time is, so they are trained to respond as quickly as possible. Keep in mind that there may be a fee involved. Do you have a funny story about getting locked out of home? Tell us about it in the comments!